The featured photo was taken by Richard B. Hoit on August 1, 1930. 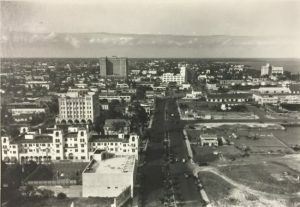 Hoit’s collection of photographs featured a lot of aerial photos of South Florida from the time he arrived in Miami in 1914 through at least the 1950s. Hoit took over 15,000 aerial photos of South Florida during his time living in Miami. The photograph was shot from the Miami Daily News Tower looking north. The building closest to the News Tower was the American Legion Hall which featured a stadium in back. This stadium was the primary sports venue for prize fights during the 1920s and 30s. This was the same building that Al Capone was arrested in twice while attending boxing matches. The land where the American Legion Building was located is now a parking lot across the street from the American Airlines Arena. Just beyond the American Legion Building was the Burdine & Quarterman building. John M. Burdine, the oldest son of the founder of Burdine & Sons department store, and his wife, Mary Quarterman Burdine, ran their department store on NE Second Avenue. The store was located at the southeast corner of NE Second Avenue and Tenth Street. North East Second Avenue was once the dream of a former attorney by the name of Fred Rand. Prior to the real estate bust of the mid to late 1920s, Rand owned twenty five corners on NE Second Avenue between First and Fourteenth Streets. 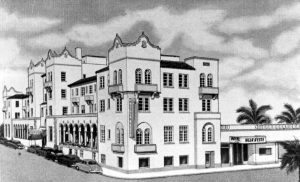 He had a two year plan in the mid-1920s to make NE Second Avenue the main business artery in downtown Miami. At the top left portion of the photograph is the partially finished Roosevelt Hotel. It was a project started by Fred Rand until he ran out of funding. The Roosevelt Hotel is the tallest building in the distance. The building sat idle and unfinished from the late 1920s until 1942 when it was completed and became known as the Technical High School. In 1947, the building was renamed the Lindsey Hopkins Education Center. Cover Photo: Hoit photograph from Miami Daily News Tower in August of 1930. Courtesy of HistoryMiami. Figure 1: Drawing of Hotel Villa D’Este. 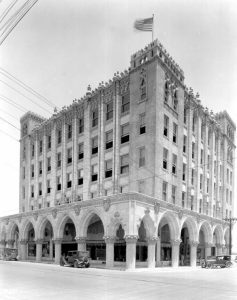 Figure 2: Burdine & Quarterman Building in 1926. Courtesy of Florida Memory.